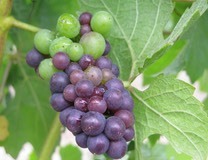 Petite Syrah is normally used as a blending wine. In recent times it has undergone a facelift and is now being marketed in its own right. This Neal wine is a great example of how winemakers develop less popular grapes and make something very interesting and pleasing to the palate. This Petite Syrah is a good example of a foodie wine; robust tannins, rich fruit flavour and was a great accompaniment to cheese. Underlying tastes of blueberry, vanilla and and oak make this a wine memorable. I am hoping it will age well, time will tell.